OFF-LEASH FUN: Dog trainer Sophie Noss and Peanut are looking forward to playing in council''s proposed new dog parks. Picture: Rebecca Hosking. Geelong dogs owners will have more options to exercise their canines after council last week announced plans for three new fenced parks. Council has yet to announce specific locations but has identified Lara, southern Bellarine Peninsula and south of the Barwon River as priority areas for the parks. 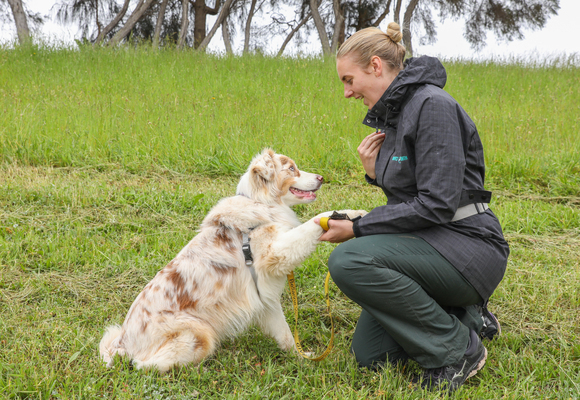 Leopold dog trainer Sophie Noss said the parks would provide pet owners with opportunities to “connect” but were unsuitable for some dogs. “A dog park can be a place of play for some and a place of nightmares for others,” she told the Indy. Ms Noss said the parks would help “educate owners”. Ms Noss encouraged owners to still “actively work” with their dogs in the fenced spaces to “ensure happy, healthy environments”. “These areas are great, but there still needs to be some effective control from owners,” she said. Greater Geelong has one existing dog park for a population of more than 34,500 registered dogs. Previous council survey results revealed that more than 80 per cent of dog owners supported the development of additional fenced dog parks. The parks will be funded through the council budget and would not replace existing off-leash areas, according to council.